A Terrine is basically a French dish traditionally made from scraps of meat pressed down and baked into a loaf. This pressed down technique lends itself beautifully to starchy potatoes bound by cream. When pressed down and cooled, the sliced up loaf can be pan-fried to yield a crisp texture. 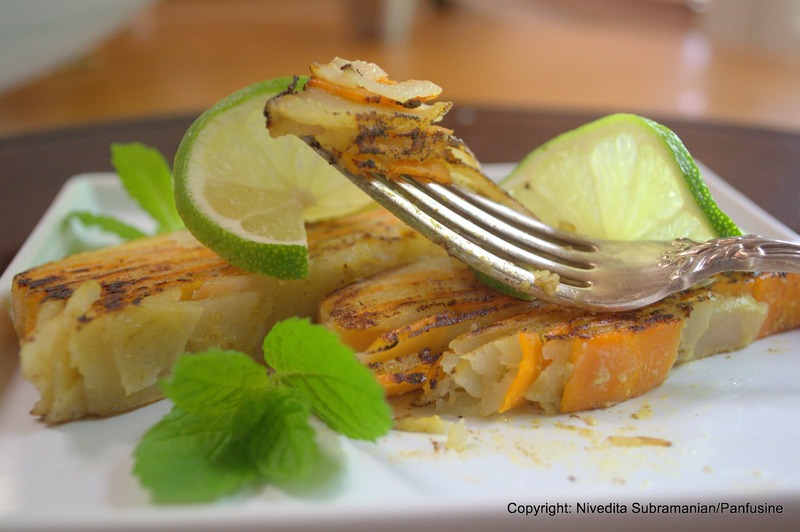 The end result is a decadent side dish that may be served with your choice of entrée & a simple green salad. Such techniques however never feature in Indian cuisine. Ever. First and foremost, because baking is not a preferred means of cooking, and foods cooked and served the next day are generally frowned upon. This is primarily because of the weather conditions in most of India. Heat & lack of refrigeration do not lend themselves well to edible dishes that are meant to be served the next day, least of all terrines. I settled on ideas from some of my earliest posts on Facebook, pre - blog days. 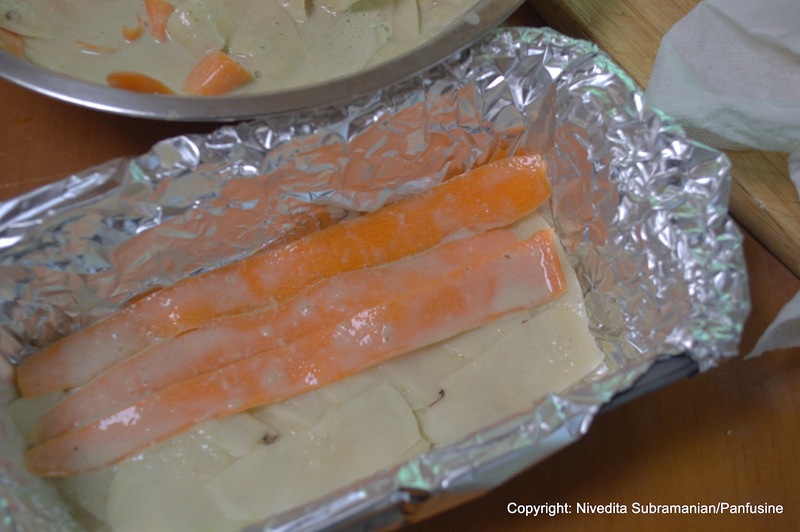 The classic dish from Kerala, Avial coupled with a French terrine recipe. The original inspiration was posted on Food52.com by blogger activist Perennial Plate, a.k.a Daniel Klein. This Avial terrine has been through a test run that was tasted & approved by senior family members visiting from India. Although it was tempting & would be great, I stuck to using just two vegetables for the sheer simplicity & beauty of the cut cross section of the loaf. I advise using canned coconut milk primarily for its consistency with respect to the recipe. 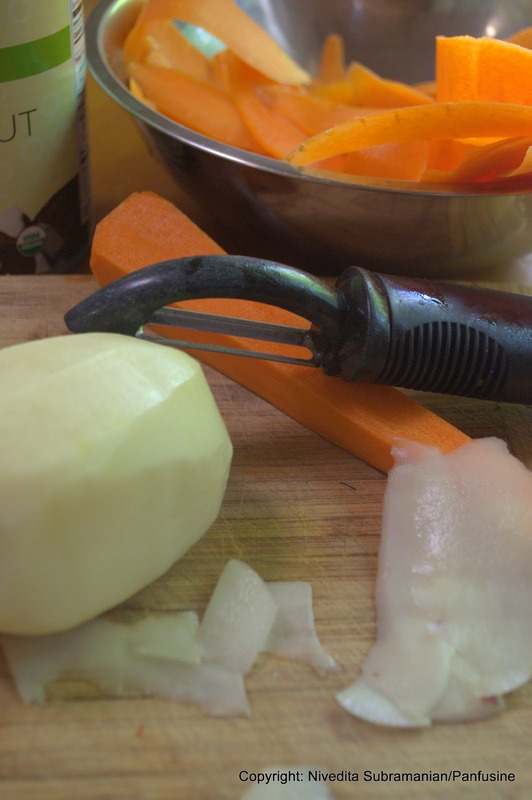 Using a vegetable peeler, peel the outer skins of the vegetables & discard. Using the same peeler, peel strips of the carrots & potato and add them to a large mixing bowl. Combine the coconut milk, cumin, green chiles and salt & blend to a smooth liquid. 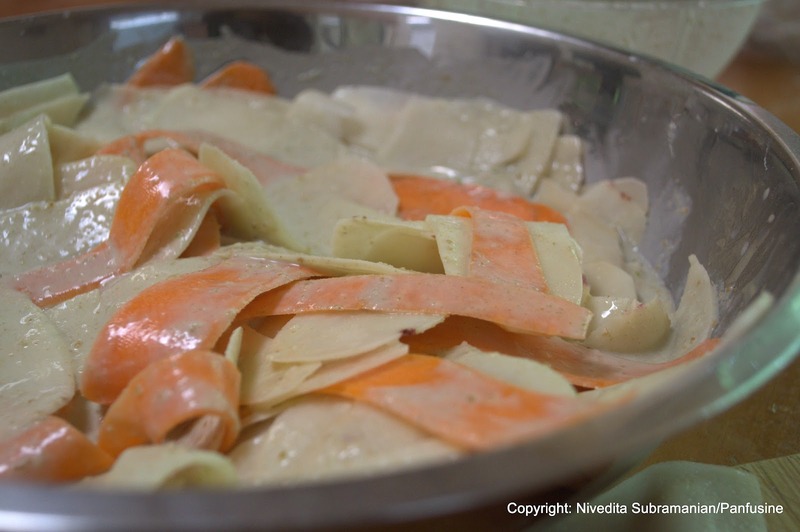 Pour this liquid out into the mixing bowl containing the potato & carrot strips & toss to coat the vegetables well. Line a 4 x 8 inch loaf pan with Aluminum foil, leaving enough foil sticking out from the sides to completely cover the pan. Using clean fingers layer the potatoes & carrots in alternating layers all the way to the top of the loaf pan (~ 2.5 inches deep). Begin & finish with a layer of potatoes. Cover with the extra foil flapping over the rim and bake in a 350 F oven for about 1 hour. At this point a sharp knife inserted into the center of the potatoes should sink in with minimal resistance. Remove from oven and cool. Cover a piece of cardboard with aluminum foil and place over the top surface of the terrine. Place a heavy weight such as an unopened can over to press down on the terrine. 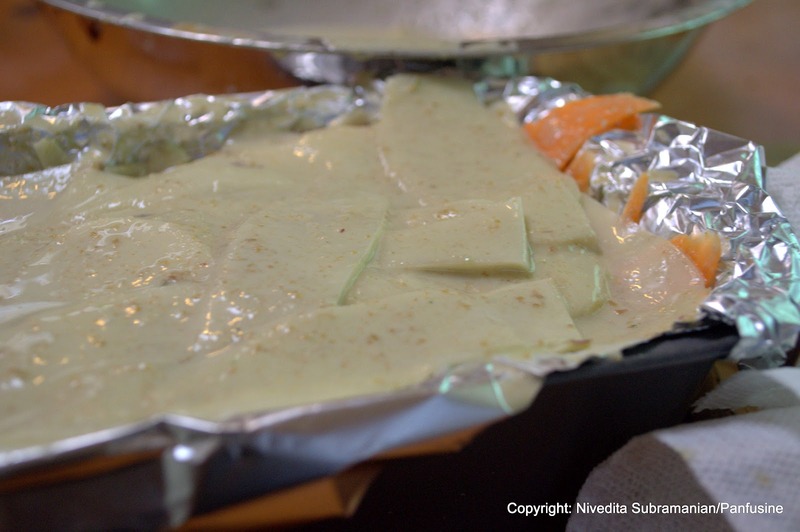 Place in the refrigerator overnight to cool, compress & set. At this point you can even freeze the terrine after its pressed down well & store for about 2 weeks. When ready to serve, remove the terrine from the fridge (or thaw if frozen). Cut into ½ inch slices. Heat a non stick skillet and add drizzle about a teaspoon of oil. Gently lay the terrine slices on the pan & fry each side for ~ 3 minutes. Remove from the skillet and place on plate. 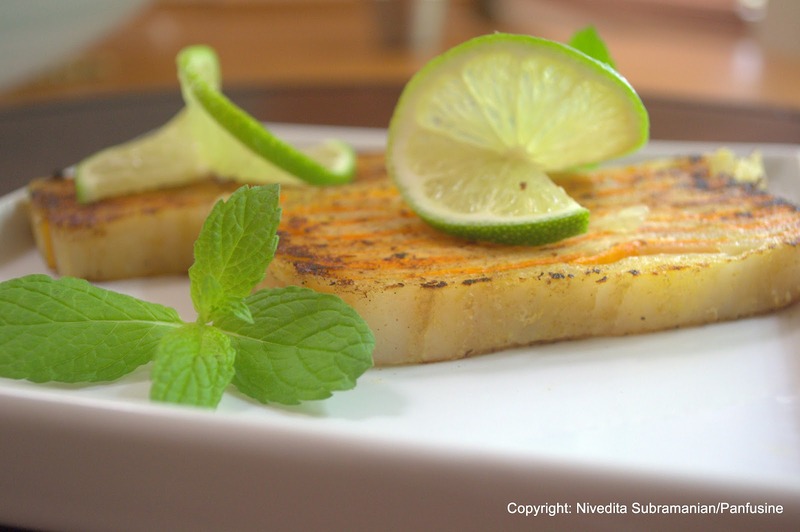 Garnish with wedges of lime, and serve along side a plate of a creamy Pongal or Bisibele. Such a pretty terrine and complete surprise in the Indian context for a savory and that tradition mention using leftovers. 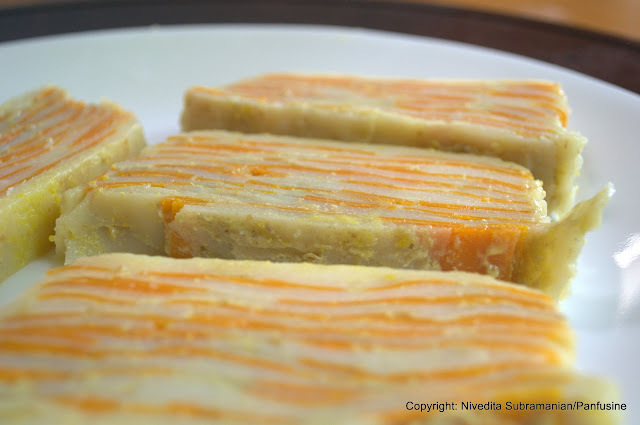 However I think of bebinca when I see a terrine and its mixed origins and that its a sweet. Thanks Anjali.. I guess the layering does resemble that of bebinca. 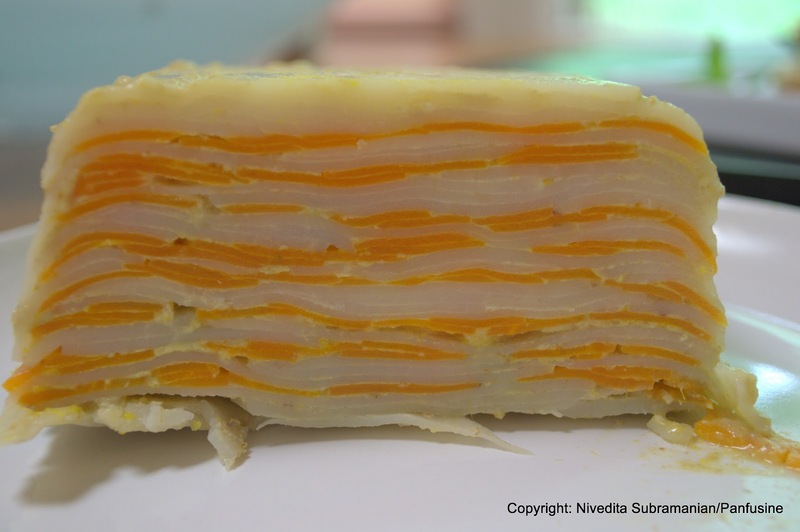 But bebinca is a lot more elegant in that it involves cooking each layer of egg individually right?